Looking for the perfect Bacon snack food? 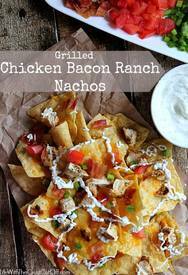 You've got to try these Chicken Bacon Ranch Nachos!! Crunchy tortilla chips topped with melty cheese, grilled chicken, crispy Bacon, ranch sour cream and your favorite nacho toppings! These make for a great appetizer, snack or dinner, no time is a bad time for nachos especially when Bacon is involved! Oh and the whole thing is drizzled with ranch sour cream, what’s not to love! !